Kirkton Cottages, part of a grouping of thatched cottages in Fortingall, designed by JM MacLaren in 1889. The list entry describes them as being thatched in an ‘English traditional manner’. Historic thatched buildings are now rare in Scotland. In 2016 the Society for the Protection of Ancient Buildings (SPAB) published a detailed record of the 300 or so examples believed to be surviving. Each one had been visited by SPAB Scotland officer Zoe Herbert and its condition recorded with the help of Historic Environment Scotland (HES). The survey revealed that only around 200 of the known examples now remain in anything like their original form. The reasons for the loss of thatched buildings are complex and the subject has generated much discussion over the past 30 years or so. Some factors are well documented: the rural landscape of Scotland underwent a period of rapid change during the social and industrial changes of the late 18th and early 19th centuries and previously common vernacular building types disappeared as housing standards improved and rural populations declined. Alexander Fenton (see Further Information) notes that the general use of thatch in Scotland was coming to an end by the 1790s, with its use being increasingly confined to poorer communities and agricultural structures. As early as 1803, when thatched buildings would still have been a common sight, Dorothy Wordsworth marvelled at the cosy charm and romance of the ‘Highland hut’, so far removed from the polite city drawing rooms and more modern slate and pantile roofed buildings which town dwellers were used to. From an early date the fire risk posed by thatch made it undesirable and sometimes illegal in urban areas, further increasing the association with a class divide between the urban and rural populations. In more remote areas the diverse local traditions of thatching continued well into the 20th century but, even to Victorian visitors, thatched buildings had largely become a nostalgic symbol of a bygone age. In Scotland, surviving thatched buildings before the 1930s rarely seem to have the status of those south of the border. Notable exceptions which still survive are Moncrief House in Falkland (1610), partially thatched Barony House (c1781) in Lasswade, and the fine Arts and Crafts style planned estate village of Fortingall near Aberfeldy. As more durable roofing materials such as slates, tiles and corrugated iron became more readily available, thatched and other traditionally constructed rural buildings became increasingly seen as below standard and were systematically replaced with more modern housing. Nevertheless, the residents of Garenin village on Lewis (Gaelic name: Gearrannan) were not rehoused until 1971 – and some only reluctantly even then. thatched house will rapidly deteriorate unless it is regularly maintained. Bruce Walker, Christopher McGregor and Gregor Stark (see Further Information) note that a thatched cottage needs continual low-level heating in order to stave off decay; part of the maintenance of the Blackhouse at Arnol, one of the few thatched properties maintained by HES, involves the daily lighting and tending of a fire. This rapid disappearance following abandonment is evident on the island of Jura, where until relatively recently a village of thatched buildings was recorded at Keils; in the 2015 survey not a single one remained with a thatched roof. Most were roofless ruins. 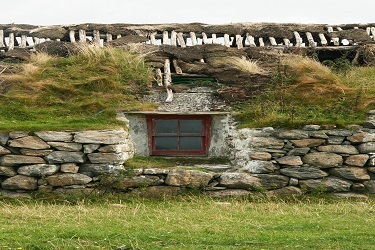 Similar losses are noted on Tiree, Berneray and South Uist, where partially thatched roofs in various states of advanced decay were recorded, despite being relatively recently known to be in use. are identified in Historic Scotland’s Technical Advice Note 4 (see Further Information). However, the recent survey shows that very few of these more unusual types now remain. 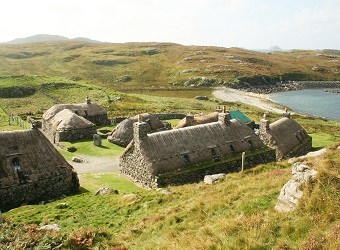 Allowing for some level of misidentification, the majority of thatched buildings remaining are roofed with water-reed or wheat straw, with marram grass still predominant in the Western Isles. Only 26 examples of heather-thatched roofs were identified in the survey, with rarer types such as bracken (five), rush (ten) and less common types of cereal straw reduced to a handful of identified examples. Reed and cereal straw together account for more than half of surviving buildings, followed by marram grass (almost a quarter of buildings surveyed). A 19th-century cottage at Plockton, Wester Ross, which is listed as having a ‘piended [hipped] heather thatched roof’. Unusually, it still retains one. As the SPAB’s survey notes, the ridge is continuous, with the heather secured by a single horizontal wire to the ridge by pegs, partially obscured by the timber poles which delineate the ridge. Changes in land-use, farming developments including harvesting and threshing methods, manipulation of crop types to produce higher yields, loss of labourers, depopulation and two world wars have all had an impact on the rural economy and the many trades and traditions which it once supported. Nevertheless, it is unclear why some common materials are no longer readily sourced, with reports tending to be anecdotal and dependent on local relationships. On the Western Isles, where a significant number of thatched buildings do survive, changes in land ownership and access have led to a decline in the availability of marram grass traditionally used for thatch. Marram grass is an ideal thatching material for the Hebrides as it can withstand strong winds and scouring from wind-blown sand. Imported materials are not naturally adapted to the climate and tend to perform less well. Thus the local material tends not only to be the most aesthetically pleasing but also the most durable. Many areas of wetland that produce reed thatch, traditionally found in Tayside and Fife, are now protected as wildlife habitats or designated as Sites of Special Scientific Interest (SSSIs), which can mean that harvesting the reed for thatch is not always possible. The reed beds at Errol are said to have once produced 40,000 bundles a year for thatching, but to the author’s knowledge there is currently only one supplier of local reed in the area. It is not uncommon for reed to be imported from Eastern Europe and used sometimes indiscriminately, even in areas where there is no tradition of reed thatching. However, both the ecology and the thatching trade seem to benefit from managing the wetlands; therefore, sustainable harvesting of the reed beds may be advantageous in several respects. 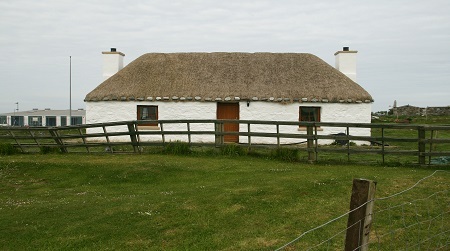 A cottage on the Isle of Benbecula, re-thatched using marram swept over the ridge. Netting covers the thatch and is weighted at the eaves with large stones tied on with wire. 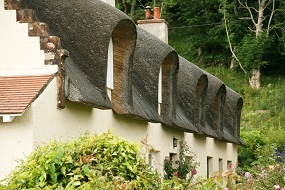 Local authorities sometimes report requests for re-thatching using non-local materials, citing lack of availability of materials as an issue. Where local availability of specific thatch types has changed, however, perhaps the immediate focus should be on finding suitable alternative local materials rather than sourcing a historically ‘correct’ material from further afield. It seems irrational to source reed or wheat straw from abroad to satisfy a need for visual continuity, when suitable local materials (albeit different) are available. Recently, advice was sought from HES by an owner on the Western Isles seeking to re-thatch a marram roof with locally grown bere straw, as marram could not be sourced. 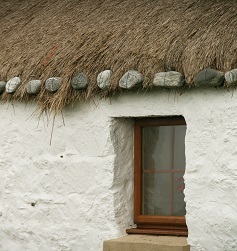 In future, perhaps this type of local responsiveness may be part of the answer to maintaining thatch, allowing for seasonal and regional changes over time as part of the natural life-cycle of the building without being too dogmatic about historical precedent, while adhering to local traditions of application, fixing and detailing. and there is at present no active programme for skills to be passed on. A comprehensive N/SVQ (National/Scottish Vocational Qualification) was developed specifically to train thatchers in Scottish methods, but there is no college currently delivering the programme. Part of the response to the survey should be to revive the training programme and make it fit for purpose. 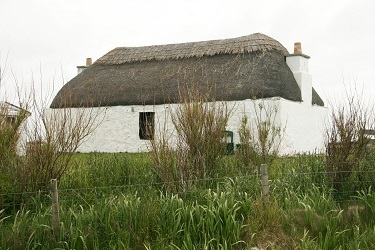 A late 19th- or early 20th-century cottage, also on Benbecula, which according to the list description had a ‘muran [marram] thatched roof secured with ropes and modern bricks as weights’. The SPAB records that it appears to be thatched in reed and/or straw, scobed (secured) with hazel spars at the ridge. The thatching tradition in Scotland is different from that of much of England where long straw, water reed and combed wheat reed are more commonly found. 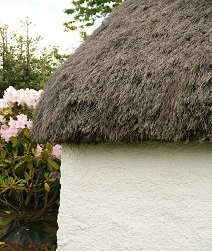 Due to a real or perceived lack of local skills and materials, and often for reasons of practicality, it is not uncommon to see the local vernacular replaced with a standardised English thatch style, inappropriately detailed. Perhaps not surprisingly, this is sometimes due to the unwillingness of visiting thatchers to do work in what they consider a ‘substandard’ way. These styles, however accomplished, lack authenticity in the rural landscape. maintenance requirement means that the burden of maintaining a traditional thatched roof is often neither desirable nor feasible. 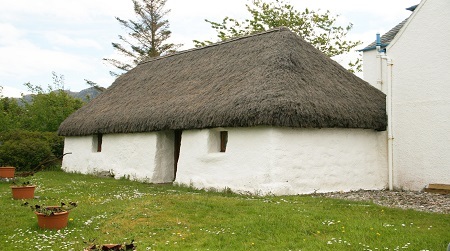 For this reason, examples of traditional Scottish thatching are increasingly being limited to open-air museums or maintained as holiday lets. Ian Whyte, writing about blackhouses in 1980, suggests prophetically that soon ‘only the Blackhouse Museum at Arnol will survive as a memorial to a vanished housing and social tradition’. only be sustainable if local materials can be accessed affordably and the necessary skills can be found at a price that is viable for the building owner, appropriately supported by heritage agencies. Following the publication of the survey, HES has undertaken to develop and implement an action plan to prevent the further loss of thatched buildings and to support their conservation. 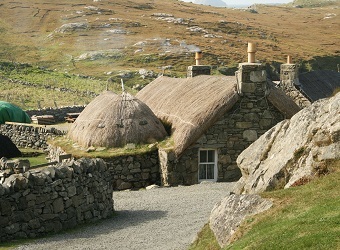 Proposals include reviewing the statutory designation of some, to ensure their significance is recognised – a process that has already been started by the Listing and Designations team, focussing on the Category C listed buildings that may be most at risk of being overlooked, and the best examples of particular types of thatch. Inevitably this exercise will also lead to some buildings being de-listed – those that have been lost completely or significantly altered; but the review will enable better protection of the thatched buildings that do remain, and will raise the profile of this building type in the historic environment. Thatched buildings are now so scarce that arguably all of those with any historic or architectural merit should be protected. If these buildings are valued, and the response to the survey suggests they are, then intervention will be necessary. This could be in the form of taking significant and at-risk thatched buildings into care, enforcing planning regulations more stringently for thatched buildings and committing additional financial support. It is clear that the grants offered by HES’s Thatched Buildings Maintenance Scheme have been instrumental in enabling property owners to continue to maintain thatched roofs. Without this financial support, it is likely that many more buildings would have been lost. However, it is equally clear that this is largely dependent on the good stewardship and effective delivery of the grant scheme. It is notable that in the Western Isles (particularly in the Uists) the management of grant funding and listed building control has resulted in an increase in the recorded number of thatched buildings: the survey identified 42 in the Uists, considerably more than expected. Good management practices and support for the development of local skills and materials sourcing could promise similar results in other areas where thatch has declined. The HES grants (see Further Information) have now been assimilated into the larger Historic Environment Support Fund, which enables a broader variety of activities to be financially supported, including training, materials sourcing and enabling work. HES has undertaken to continue to financially support those who maintain thatched buildings, and provide additional financial support and training for activities that contribute to the maintenance and survival of Scottish thatching skills and materials. cottages. With concerted action and dedication, there is a chance to reverse this decline and avoid the preventable loss of a beautiful and distinctive type of Scottish vernacular building. JESSICA HUNNISETT-SNOW MRICS IHBC is a senior technical officer at Historic Environment Scotland.